This blog is in response to my podcasted interview with Kim Babeu. I’m always deeply intrigued by where people start with Universal Design for Learning (UDL). It’s one of the first questions people ask – “Where do I start?” I always invite people to begin where they are most comfortable. To begin with what resonates with them the most. To begin with whatever will meet the need they have identified. Kim was already a seasoned educator with 38 years of experience prior to learning about UDL. She was recognized as the Arizona Teacher of the Year back in 2005 and took the act of engagement very seriously. She also took the act of representation very seriously. A visit to her high school classroom was like entering a shrine of student work that celebrated students and their accomplishments, but also communicated that serious work goes on there. Pictures of students in their caps and gowns surrounded a graduation gown and cap stapled to the wall offered proof positive that their peers had walked this path and had met their goal. Stations with materials, a calming location, and book shelves with current, applicable, and student-focused books were all around. (Kim does have a couple of shelves of old textbooks, but those are only used for physics experiments…they are the subject of the experiments, they are not read). 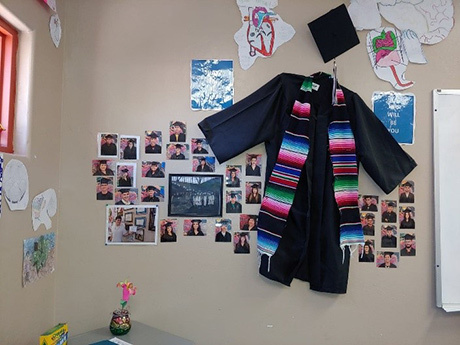 Image: Graduation cap and gown stapled to the wall surrounded by pictures of students in their cap and gown. For example, while she always had markers, colored pencils, mix media, and other tools her students could use to learn about anatomy, that process had always been very structured. She guided the students in what materials they would be using. And while students had their phones/mp3 players in class, they had to be turned off unless they were using them for an assignment. After talking deeply about choice as a way for learners to become more self-determined – become active participants in their own learning and seeing how their choices have an impact on their learning – Kim decided that this one of the areas she was going to try. She watched her students flourish in their learning. It didn’t seem to matter which option the students were choosing to learn about the anatomy of the upper body, they were succeeding. And, they weren’t stuck just using one method. She encouraged them to mix their methods until they found the one that worked for them, including having one earbud in and listening to music if that helped them. A student who traditionally kept to himself became a classroom leader, showing the other students a strategy he used to grid the body to chunk his learning. While Kim expanded how she Represented the information to them (with a focus on Language & Symbols), she was really driven by all of the guidelines under the Principle of Engagement. Another major takeaway Kim had from our session was how the language we use in our learning environment impacts our students. She decided to use the word “assessment” rather than tests and quizzes. It’s very important to know what our students are learning, but it’s equally as important to help them identify and use their coping skills and do as well as they can during that assessment. Kim took the steps necessary to explain to her students why she was shifting her language. She took seriously the purpose of formative and summative assessments and why the former are so much more informative to the teacher and the learners. She explained that assessments are moments along the way to check in, to see how something might need to be taught differently, and to celebrate accomplishment. Quizzes and tests are seen by many learners as conclusive, not moments along the path of learning. Although it was a shift in language, Kim also had the mindset in place that allows this word to be as flexible as intended. Simply using a different word doesn’t lead to long-term change; there must be a shift in actions that go with that word. As you heard during the podcast, Kim is seeing unbelievable levels of accomplishment in her classes. Students are excited to learn, to try new methods of learning, and to show what they know (to be assessed). They are showing up, participating, and accomplishing at the highest levels she’s ever seen. They are also building community among themselves and with others important in their lives. Students who have never taken work home to show the those who mean the most to them are now posing for pictures. They are proud of their accomplishments and are creating their own celebrations. That is empowerment in action. So, is this the power of UDL? Yes. Yes, it is. How do I know? Kim entered those training days with a lot of pedagogical and content knowledge. She had beautiful relationships with her students. Her students produced great work. But through her investigation of the framework, she started to identify some things she wasn’t doing. She didn’t just accept those ideas and go, though. Kim learned why these things were important and reflected on them. She took the time to see where she could wind them into her learning environment so all of her students would benefit and then she paid attention to how her students reacted. The UDL framework took her there. The act of teaching is dynamic and filled with so many choices. The UDL framework guides those choices. 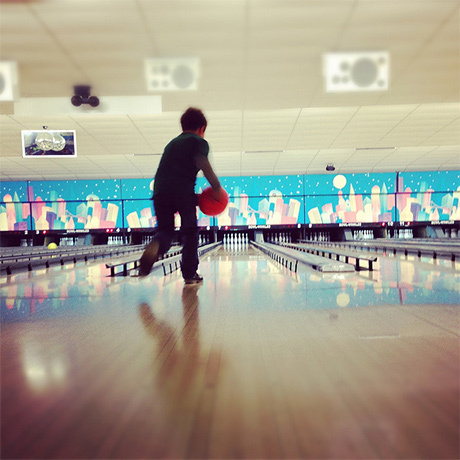 If you take the time to learn deeply about the framework, it becomes the bumper rails of the bowling lane. By using it, you design a learning environment that removes structural, emotional, and even pedagogical barriers, allowing your learners to move toward the goal.